This pair of carriers are painted with original black, gold and red paintwork depicting the vineyard crest with the original carrying straps to the reverse (these could be easily removed if required). Chateauneuf-du-Pape is a historic town in the South of France translating as 'new castle of the Pope', the town was chosen as the new home for the Court of Pope of Avignon in the 14th century and for hundreds of years this area has had a reputation of producing excellent quality wines. 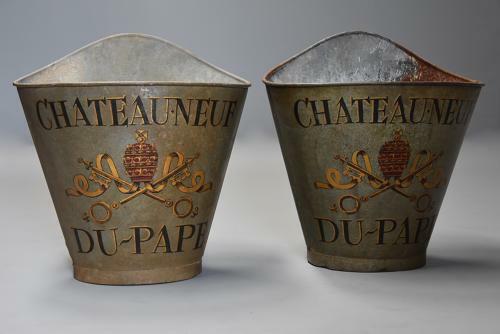 This pair of grape carriers are in very good, original condition for age and are superbly decorative items or can be used as storage pieces for logs, papers, wine etc.